For collectors and dealers alike, accurately pricing a coin remains perhaps the most difficult process in all of numismatics. This shouldn’t be the case as there are numerous price guides who offer years of experience and expertise to assist collectors and dealers. Unfortunately, none of these are 100% accurate as many coins are exceptionally difficult to price. This in and of itself leads to confusion but there are more factors to consider when evaluating a coin’s price: How original is it? How colorful is it? How rare is it? How in demand is it? I’m going to select five fairly random (and totally hypothetical) examples of better date gold coins and discuss how I would come up with a fair retail price for each one. To help us with base levels for each issue we will use the CDN, the NGC Price Guide and the PCGS Price Guide. We will also use recent auction prices (APRs). Our first coin is a decent quality but not really choice NGC EF45 1839-O quarter eagle. 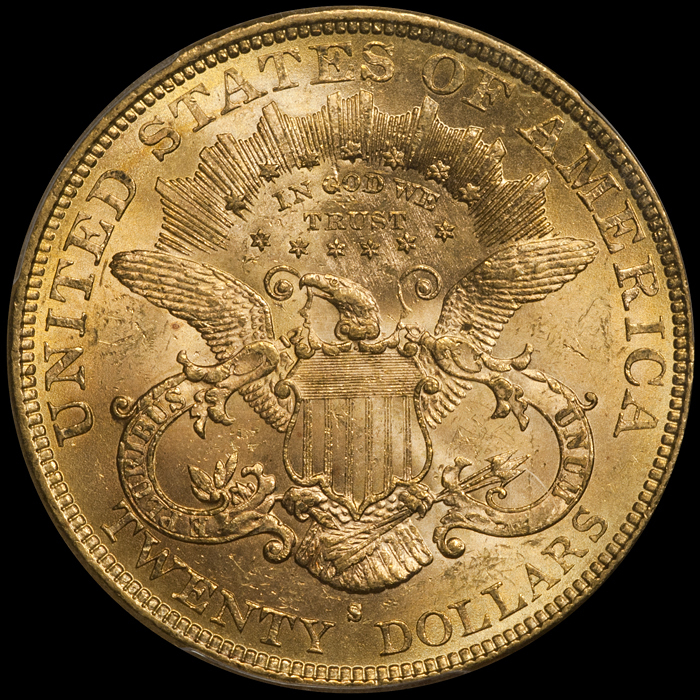 This is an extremely popular issue due to its status as a one-year type and as the very first quarter eagle from New Orleans. It is a fairly common issue in Extremely Fine but at this price point it is in demand. This is an easy coin to price. There are two APRs which are reasonably current and the coin itself is nothing special. I’d say $2,650-2,950 is a fair range. In this case, the published price guides are a bit on the high side. 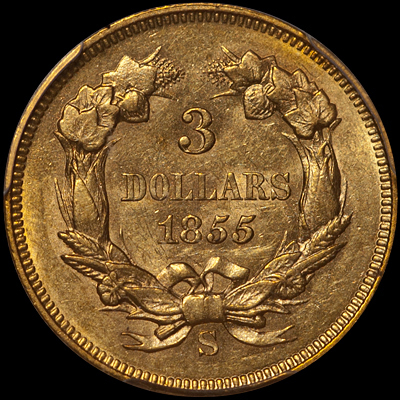 Our second coin is a very choice, fresh-out-of-the woodwork 1855-S Three Dollar graded MS61 by PCGS and approved by CAC. This isn’t necessarily a very popular coin but it is very rare and desirable. A quick search of this imaginary coin reveals a population of just one in MS61 with one finer (an MS62+ which sold for $55,225). Recent APRs for MS61: None, but a PCGS AU58 CAC brought $18,800 in late 2016, and the aforementioned PCGS MS62+ realized $55,225 in early 2016. This is an extremely hard coin to price. As a rare date gold specialist, I am aware that the Three Dollar series is finally showing signs of life after years of stagnation. I would be a willing buyer for this 1855-S given it is a population one with one finer coin which is numismatically significant, and which would be the only example of this date approved by CAC in Uncirculated. I think this date is now worth at least $20,000 in PCGS/CAC AU58 and the 2/16 APR for the PCGS MS62+ now seems sort of cheap; today it is easily a $60,000+ coin. Given this data, it seems that $40,000 is the right number for our MS61 as it is midway between a nice AU58 and an MS62+. Could I see it priced higher? Absolutely, and I certainly wouldn’t pass at $45,000, but $50,000 feels like too high of a number. As you can see, pricing a coin like this is sort of like throwing a dart at a board. You have to use your expertise and your feel when establishing a price for a very rare but thinly traded coin. For this coin, published price guides aren’t especially helpful. Hopefully, after this coin was sold, they would be changed to reflect this transaction. 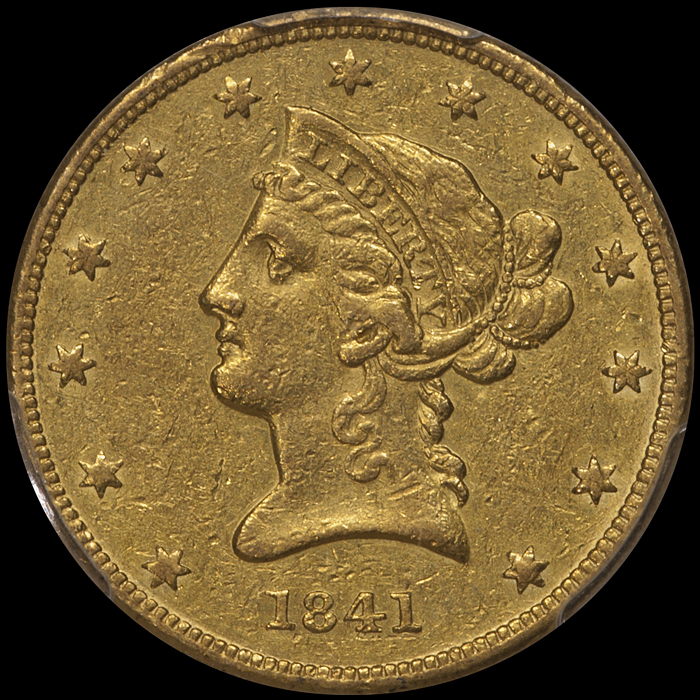 Our third coin is a slightly above average PCGS AU50 1873-CC half eagle. This hypothetical coin has been to CAC and it wasn’t approved but it is nice enough to be in my inventory. Any collector with basic knowledge of the Carson City half eagle series knows that the 1873-CC is scarce in all grades and it is quite rare in properly graded AU. Recent APRs for PCGS AU50: $25,850 (5/18) and $21,150 (2/14). These are the only two records for PCGS AU50; the most recent NGC record is $21,150 in 1/13. Despite this coin’s rarity and the long-time popularity of CC half eagles, this isn’t a date collectors seem to appreciate and I’ve had trouble selling the last few I’ve owned, making me unlikely to be an aggressive buyer of this coin unless it were really choice. The most recent APR is current enough that I’d want to price another example slightly below that record to make it move more quickly. So, even though there is just a single record for a PCGS AU50 in the last five years, I’d probably want to pay around $22,000-24,000 for this coin and sell it as $25,000-27,000. In this case, published price guides are reasonably accurate. Our fourth coin is a really nice PCGS/CAC AU50 1841-O eagle. It is accurately graded and original; not an upgrade but very nice. No Motto New Orleans eagles are currently very popular and this is one of the rarest issues in the series. A quick glimpse at population figures shows seven graded AU50 by PCGS with eight finer (these numbers are almost certainly inflated) while CAC has approved just a single coin with two finer. Clearly, this is a great coin and one I would be an aggressive buyer of. Recent APRs for PCGS AU50s: The last sale was in 6/2007 at $23,000 while the last NGC AU50 was $21,150 in 9/16. In this case, I’d look at AU53 APRs as well, and the last PCGS AU53 sold for $25,850 in 1/14. In my opinion basal value for a very average quality AU50 example of this date is at least $25,000. Since our hypothetical coin is both PCGS and CAC (and nice), I can easily see paying $30,000-32,500 for it and would moan and complain at $35,000 but would still likely write a check. I would then price it at $37,500-42,500 depending on the circumstances. Yes, that’s a lot of money but this is a really good coin with a large pool of potential buyers. In this case, all published price information is well too low. This is attributable to these sources not realizing how significant a coin this and, as I stated above, not all AU50’s being created equal. Our fifth and final coin is an NGC/CAC 1879-S double eagle graded MS62. Let’s assume this coin is really nice; not likely to upgrade to MS63 but a virtual lock to cross if submitted to PCGS. 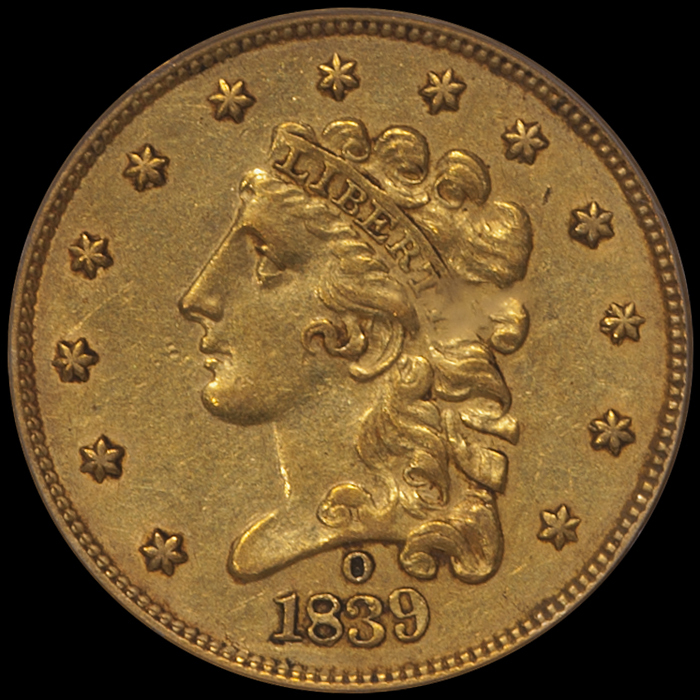 The 1879-S is a very funky date which has a huge price spread between MS62 and MS63. An average quality MS62 is worth around $9,000, while an MS63 is likely worth in excess of $30,000. Only eight have been graded MS63 by PCGS (none by NGC), but with 99 graded MS62 by PCGS (plus 53 by NGC) the chances are good that at least a few coins will gradeflate into MS63 holders. Recent APRs for PCGS or NGC MS62s with CAC approval: $13,200 (4/18; PCGS), $18,600 (4/17; NGC), $14,100 (8/16; PCGS), and $14,100 (4/16; NGC). Enough of these in MS62/CAC have traded in the last year to note that prices are trending downwards on this date/grade. This is due to a large hoard of US gold coins come into the market from overseas sources. This hoard includes numerous early Type Three double eagles from San Francisco and the market is reacting to this increased supply by dropping in price. Even the last NGC/CAC MS62 traded for $18,600 in April 2017, I view this as an outlier. I would probably want to be in this coin at around $11,000 so that I could price it below CDN Bid; say at around $12,250 or so. In this case, the published price information is too high as it doesn’t take into account the market dynamics that are reshaping Type Three double eagles. Some better-date US gold coins are very easy to price but the majority of them are not. A wide variety of factors impact the market, ranging from the quality of the specific coin to the rarity of an issue to its level of demand and to external forces such as hoards. Collectors and dealers who focus too much on published price data will find it frustrating to buy choice and rare issues. It is my opinion that only with years of personal observation and experience can collectors properly price these issues. What are your thoughts about rare coin pricing? Please feel free to share them in the Comments section below.